The Lake Eucumbene Chamber of Commerce was established at a public meeting in December 2002 and since then it has worked hard to foster business and economic development throughout the area. The Chamber believes that active business and social policies lead to economic development, and that a healthy business and community environment are intertwined. 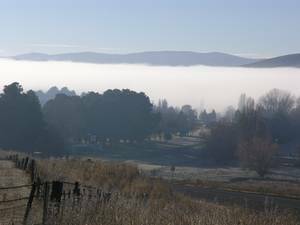 The area it services is north and north-east of Lake Eucumbene in a 20 km radius centred around Adaminaby. To improve the quality of life, wealth, sustainability and resilience of the Adaminaby district by strengthening and promoting its community, business and commercial sectors. • Functioning as an effective Chamber of Commerce and community association through representation and advocacy; coordination and facilitation of community building projects; and through networking and member services. Although the chamber has been a little quiet on the forefront, we have been busy working toward a better local economy. I wanted to take the time to update you on our latest endeavours and goals. I would firstly like to thank Bill Leane for all his hard work and many hours put into our chamber. Bill recently stood down as Chair of the LECC to focus on his family. We wish Bill and his family all the best. During Bill's time as Chair, he followed and acted on many projects. He took great interest in the Redfin threat to our waterways with Snowy 2.0. Bill tirelessly followed the progress of the NSW trout fishing strategies to ensure that the Redfin threat was not overlooked. Many strategies have been proposed but the most beneficial and effective of those is to grow trout to a predatory size before releasing. Not only does this increase survival rate of the fish, it decreases the number of fish require to be released as there will be less fatalities. The spin off from this strategy is a greater number of large trout for our fishing economy. The more fish, the more caught and the better exposure for fishing in our region. We will be sure to continue to follow this issue to ensure the security of our fishing economy. Our treasurer Tim, has been working on a project to encourage outdoors enthusiasts to the foreshores of Lake Eucumbene. A shared track spanning from Seven Gate to Providence Portal, suitable for walkers, hikers, cyclists and horse riders. The project has been split into 4 stages to make it visible. Tim has gained a great deal of traction to get the project off the ground. We will be sure to keep you updated on this great project. As acting Chair I intend to be more involved in our chamber and find the issues that are important to our members and address them. With the assistance of SuttonNet, I now have access to the chamber run page, www.visitadaminaby.com.au and intend to audit the page to update the current content and keep the page fresh and inviting. I must commend the page and all the work that has gone into it as the information on this site is extensive and incredibly useful to our visitors and residents alike. Please, take the time to visit the page. If you have any suggestions for the site please feel free to contact me either via the online contact form or at ruth@eucumbenechamber.org.au. I am raring to get stuck into the webpage and excited for your feedback, I do ask though that you be patient with me as it is a very time consuming task to audit and update the webpage. If we have any members with graphics skills, I would love to here from you! While on the subject of feedback, we have generated an online contact form for you, our business', to submit your concerns and suggestions for local economic growth. You can follow THIS LINK to the feedback page. A letter will also be distributed to non members and the general community are welcome to participate in this survey too. We hope to generate more enthusiasm for our region's economic growth and address any pressing issues there may be to secure a better industrial future, WITHOUT losing our identity. The survey will close November 26, 2018. Recently, the LECC, Cooma Chamber, Jindabyne Chamber and Dongwha Mills Bombala representative gathered along with representatives from Snowy Hydro, Snowy Monaro Regional Council, Queanbeyan Business Enterprise Centre, NSW Department of Training and Education and the Department of Premier and Cabinet. This gathering was in aid of collaborating with our wider region to be Snowy 2.0 ready and also to ensure our business security weather Snowy 2.0 goes ahead or not. We all went away from this with a focus and goal for our next gathering. The DPC will be collating housing data along with data on short term accommodation and skilled workers in our region, just to name a few. This will then be used for strategic planning during our next meeting and into the future. In the short term, we all need to be doing our bit to promote our business', region and investment opportunities. Kris Laird from the BEC has offered her services to our region. We will be arranging a date with Kris for business training and advisory services. Individual, one on one times will be available with Kris along with group training and seminars. These sessions will need to be booked in the next couple of weeks, if you have any aspects of your business you would like assistance with please let me know so I can arrange the appropriate training sessions. Alternatively you can contact Kris directly on the details below. Kris will also be available on the afternoon of November 22nd. To meet with Kris on this date please contact her directly. As you are aware, there was quite the scare that we would loose our local swimming pool. The community rallied in true community spirit and greatly increased the attendance number. During this time we were able to secure swimming lessons and also raised a small amount of community funds. As for the lessons, we would love to be able to facilitate them again and will be making enquiries to try and secure an instructor. As for the community funds, it is time to inject them back into the community. The LECC would like to hold a design contest for signage for our pool. Details are are still in the works but you can expect this to be announced soon. None of this could happen if it were not for our dedicated Jan! Jan spends hours applying for grants, consulting with relevant organisations, completing forms and all the tedious paperwork that goes with running a chamber. She is the glue that holds it all together. Thank you Jan! Please feel free to pass this email along to anyone in your contacts list that may be interested in what the chamber is up to. Members are notified that the AGM will be held at 6pm in the small dining room of the SnowGoose Hotel. 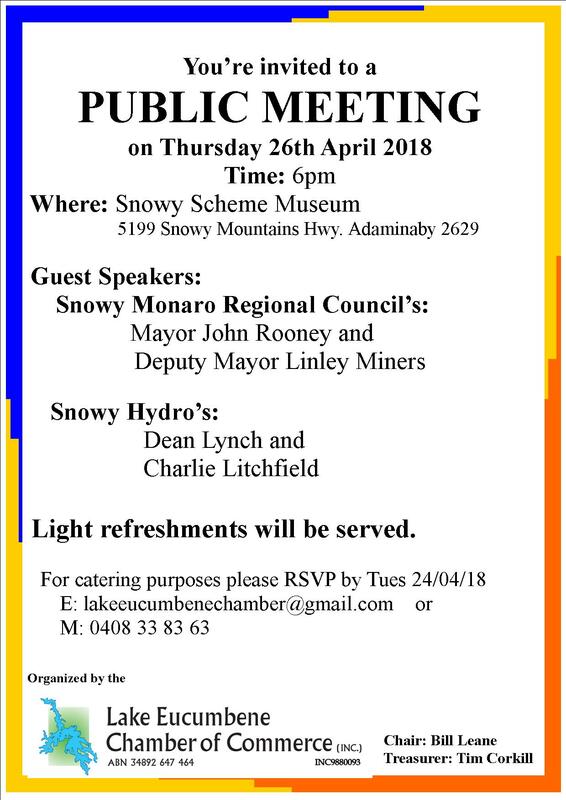 Thursday 26th April @ 6pm, at the Snowy Scheme Museum: public meeting with the Mayor and Deputy of the Snowy Monaro Regional Council, and Snowy Hydro's Dean Lynch and Charlie Litchfield. Refreshments provided - for catering purposes please rsvp by Tuesday 24th April by email or phone 0408 338 363. New committee: Chair: Bill Leane; Deputy Chair: Ruth Cox; Secretary: Jan LeckstrÃ¶m; Treasurer: Tim Corkill. The Administrator and staff from the Snowy Monaro Council's Waste Department will meet with businesses and community members serviced by the Adaminaby Tip. 2. The Chamber has been contacted by both Essential Energy and ActewAGL regarding possible significant changes to both charges and the structure under which energy will be charged from 01/07/17. Members and the general business community ought to be aware that these changes are being considered. The Secretary has already been contacted by IPSOS which has been contracted by Essential Energy to conducted business/community consultations. 3. On Monday 20th June @ 5.30pm Dean Lynch the Snowy Monaro Regional Council's new Administrator, met with Chamber members in the small dining room of the SnowGoose Hotel. This was a very positive, well attended meeting, where businesses and community groups heard about the changes and exciting prospects for the future of the new Shire. 4. On Tuesday 7th June, Diane ( Chair & right) and Jan (Secretary & left), met with the new Regional President of the NSW Business Chamber, Orit Winters (centre) and Gary Ryan, the Regional Manager. They discussed working with the new Snowy Monaro Regional Council and the importance of the role Chambers would play in this. 5. In Cooma on Tues.24th May Jan (the Secretary) received a Monaro Service award from John Barilaro MLA (rhs) and Bronny Taylor MLC (lhs). This acknowledges the importance of the work done by the Lake Eucumbene Chamber, not only for this region, but for the whole of the Monaro. 6. The Lake Eucumbene Chamber of Commerce held its AGM on Tuesday 26th April 2016 commencing at 6pm in the small dining room of the Snow Goose Hotel, Denision Street Adaminaby. The office bearers agreed to fill their positions for another year. 7. John Barilaro MLA, our local State member for Monaro, visited Adaminaby on Friday 4th March arriving at 11am. He came to meet Chamber members to visit the Adaminaby Pool and meet with local businesses. He met with members from 12 noon. Eden-Monaro's Federal member, Dr. Peter Hendy, announced that funding from Round 1 had been secured to build a tower at Anglers Reach to provide mobile coverage around Lake Eucumbene. The LECC is delighted to hear that a tower is also to be built at Dalgety. In February 2014, working with the Snowy River Shire Council, the LECC submitted a detailed submission to the Federal Department of Communications to address blackspot issues in the Lake Eucumbene region as did the Anglers Reach and Old Adaminaby Progress Association. It will be of great benefit to all businesses situated around the Lake that this has been achieved and the Chamber is delighted with this result. Read more on the Community News page. Energy offers: market-leading energy rates through the Better Energy Manager Program. Read more about the benefits. Each Chamber member will receive an email on how to access them. You can also visit the NSW Business Chamber website to find out more about how it can help your business, and about the NRMA Business Motoring membership offer. These benefits are available to all LECC members at no cost, and at minimal cost to our Chamber. Members of the Chamber are deeply saddened to hear of the passing of Jane on April 25th. She gave unstintingly of her time and effort and played a pivotal role in the Chamber. d. From 2010 she served as Chair and Secret ary of 'The Friends of the Fish' Committee, a sub-committee of the Chamber. 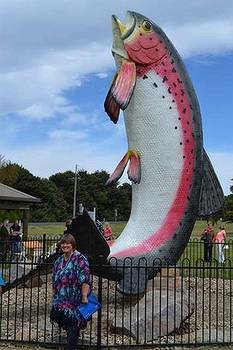 The Committee' s role was to find the funds for the renovation of Adaminaby's iconic 'Big Trout' and also raise awareness of the importance of the 'Big Trout' for the businesses of this area. She succeeded admirably and was instrumental in raising a total of $52K for this Project. The rejuvenated 'Big Trout' was officially unveiled on Sat. 2nd November 2013. The Chamber extends its condolences to her family and will miss Jane's cheerfulness and her commitment to community service. d. Increasing membership of local businesses. a. Annual General Meeting was held on Wed. 21st January. ii) 5.30 pm local small business owners were invited. The guest speaker was Neil Thew, EO of Tourism Snowy Mountains. He spoke about TSM and its 2015-16 campaign featuring FLY FISHING. A local web developer contracted to to combine visitadaminaby.com.au and eucumbenechamber.org.au sites to create a new mobile/tablet friendly website for the Lake Eucumbene - Adaminaby region. The new website to be wide reaching, efficient tool for local business members to distribute information, as well as a source of information for tourists and visitors to the area. Sub-committee meetings: 08/03/14; 03/04/14; 14/05/14; 12/06/14; 24/09/14. Detailed submission sent in February to Federal Department of Communications for Mobile Coverage Program stage 2: $20 million Mobile Black Spots Project in consultation with Snowy River Shire Council. $26K funding gained by 'Heritage Trail' subcommittee. This subcommittee set up signed trail with explanatory brochure in Adaminaby with additional signage in Old Adaminaby and Anglers Reach. Official Event on Sat. 02/11/2013 when refurbished 'Big Trout' re-opened and new Heritage Trails opened. Official guests included state members of parliament, Snowy River Shire Council's Mayor and the chair of Tourism Snowy Mountains. Read about the Chamber's achievements since 2002 - over $300K of funding for local projects. The Chamber has worked hard to bring these benefits to the Adaminaby - Lake Eucumbene region. All local businesses are encouraged to join the Chamber and work together to help our businesses, our local economy and our future.